Microsoft is limiting the customization options of Windows 8's start screen. It is not possible by default to select a background image of your choosing for instance, as you are limited to the designs and colors that Microsoft has selected for the interface. To change the color or background using one of the designs Microsoft has made available for Windows 8, you have to do the following. Open the Charms Bar with Windows-C, and select Settings > Change PC Settings from the options menu. This opens the start screen preferences in fullscreen, and it is here that you need to switch to Personalize > Start Screen. Available here are a selection of 20 different designs, one of which is a solid color, and about 20 different colors that you can select one from. If you want to customize the start screen beyond what Microsoft is offering, for instance to add a custom wallpaper background to it, then you need to rely on third party tools to do just that. One of the programs that you can use for the job is Windows 8 ModernUI Start Screen Changer. The application has been tested on 64-bit versions of Windows 8 RTM, but it should be running fine on 32-bit versions of the operating system as well. It is recommended to make a backup of the system before you make any modifications using the application. The program comes as a 7z file and extracts as a *.ex_ file. You need to manually change the file extension to .exe to run it. When you run it, you see an interface that looks like the one that you see below on the screenshot. 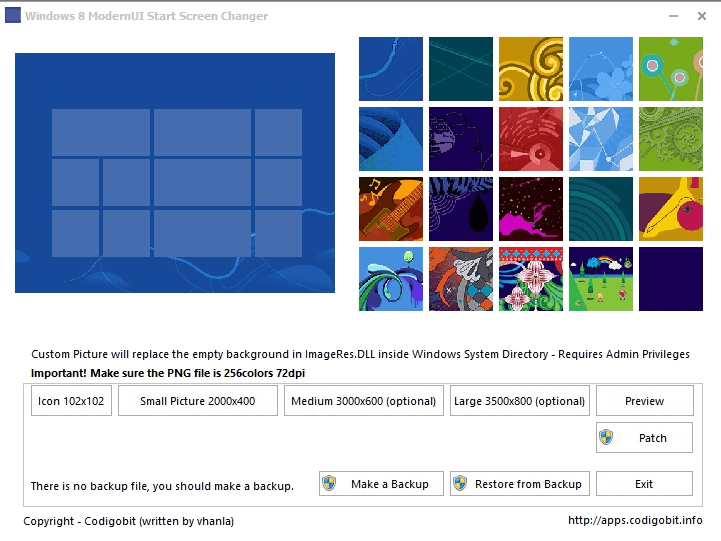 I suggest you click on the Make Backup button first to backup the imageres.dll file that holds the start screen background picture file. 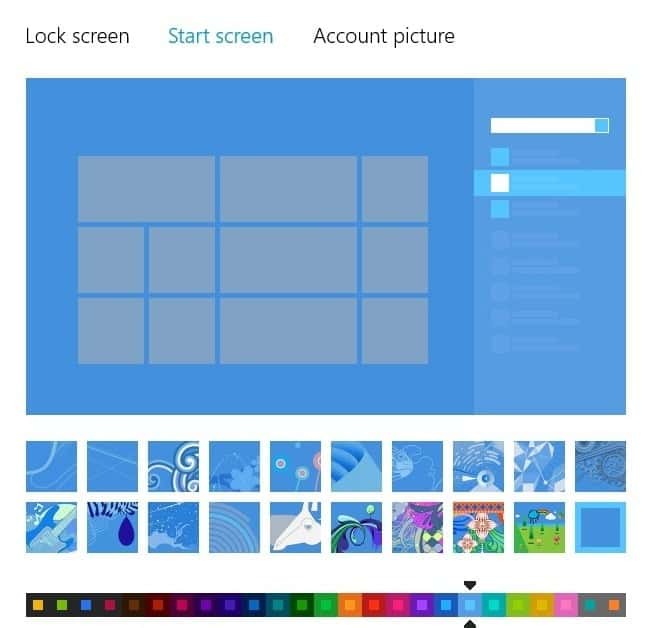 You then have options to select one of the designs made available by Microsoft here, or select the custom option instead to select your own background image for Windows 8's start screen. It does not really make sense to select the Microsoft designs, unless you want to restore one of the designs if the custom design does not turn out the way you want it to look. You need at least a 2000x400 png file for the background that has 256 colors and 72 dpi. You can optionally add 3000x600 and 3500x800 images as well. You can preview the selected image, or click on the patch button to change the current design of the start screen to the new one. If that does not work out for you visually, you can either select a different design, or select the restore option to restore the original file. It would have been great if the author would have included a few sample background images with the application to give users who do not want to create fitting background images with options to use the program without having to do so. The program is currently in beta and you may experience issues when using it. The author has only tested it on a 64-bit RTM version of Windows 8. Update: The program homepage is no longer available. You can instead download the Windows 8 Start Screen Customizer which provides you with a similar functionality. Update 2: Microsoft has improved the customization options of the Start Screen interface with the release if Windows 8.1. You can now use desktop backgrounds on the start screen as well for example. Another third party tool required to return a function that has been part of Windows since at least Win-95. Soon all these extras will use more disk, memory and cpu cycles than the OS itself! I wasn’t aware changing the background of the start menu to a custom wallpaper was available by default in previous versions of Windows. Perhaps you’d like to point it out to me? Or, if you’re talking about the desktop, perhaps you should calm down for just a minute and realize the Start Screen != Desktop. If “Start Screen in Windows8” != “Desktop in Windows7”, then what would be the closest thing to call that name in windows 7? Don’t know, so I have to ask. Let’s be fair, the start screen is a great big block of real estate that covers the screen when drawn up and has all our launch icons all over it (in a horrible mess of boxes, if you ask me), so it’s fair to consider it roughly analogous to the desktop. MS themselves say the actual desktop beneath it, and the desktop paradigm itself, is essentially dead to them. To not be able to customise this beyond the bare-bones selection of abstract art and pastel colours that MS has deigned to select for us is a pretty significant step back for people used to a level of customisation beyond the most basic of pallets. Well perhaps it’s not significant (it is only a background), but it’s stupid. There’s simply no reason this should be the case. It’s not as if it’s hard to let people have a few more colours or even select their own background. MS just seem determined to make people live with their new concept of style. I do not understand why Microsoft are continuing to persist in forcing people to look for third party solutions to enable what should be no-brainer functionality. I even have to tweak the interface to get a shut down button. It is ludicrous. So get a Mac if you don’t like where windows is going and stop belly aching about it, geez… easy. Macs are too expensive, if you don’t like the way things are going with MS, install Ubuntu OS. Macs are too expensive, if you don’t like the way things are going with MS, install Ubutu. it’s not about desktop=startscreen or not, i guess. those third party tools is only facilitate the user to modify what’s already inside windows since the earlier version (the resources) while affecting the OS’s performance if you install and run a great amount of them. yeah, start screen is a new thing but customizing windows resource library is commonly done since long ago. however, it’s always nice to simplify the steps needed using this kind of tool. i like it. You can easily change the Windows 8 Start Screen background by opening up File Explorer and navigating to C:\Windows\Web\Wallpaper. From here add your own folder and images and they will become an option in Personalize -> Desktop Background. Those folders change options for the lock screen and the desktop screen, but not the start screen. Sorry. The Start Screen in Windows 8 is equal to the Start Menu in previous Windows. The desktop is the same as it always was. It’s not hard to understand. Just because MS is putting more of an emphasis on the Start Screen now doesn’t change the fact that it is still essentially just the Start Menu. They should’ve however given the user the choice to launch either screens at startup since some users might usually want to launch a program when they turn on their computer and some prefers to launch files. But to the guy that said just get a Mac because MS is not “where the people are”, you are the perfect example of a deluded Apple fan. Before I say anything else, know that my last computer was a MacBook Pro, my last phone was an iPhone 3GS and I currently own an iPad mini so I do like their products, but what I do not like are idiots like you. On the OS X and iOS, you can’t change ANYTHING except for the desktop background (on the iOS, I couldn’t even change the background image until iOS4). So yeah, be my guest, use an Apple product. But don’t say it’s because Apple offers you less control than Microsoft because that is pure trash. Guys, stating that “MS doesn’t know what the people want” is actually very wrong. Most people don’t know what they want and can barely keep u with the fast pace IT is changing and enhancing. There are many pro’s and con’s about Windows 8. But no one can state that it is not progress, because it is. Besides, Windows 8 is a “Windows 9 ALPHA” so to speak. Be happy that a big company as Microsoft takes the leap of faith and comes up with something new. Even if you guys can’t adjust, I would gladly remind all of you that all of you started whining since Windows 95 to Windows 2000 – XP – Vista – 7 – 8, and you will keep whining about it every single time. But the most weird thing of it all, you all keep using it. So that tells me that you are the kind that talks alot, but don’t act alot. Be happy, use the system you prefer and stop whining! Or come up with ideas to actually make things better. There’s a difference between complaining and sharing good ideas/feedback for improvement. the fact that there is nothing we can do about moronic changes from MS or government or the weather is the real reason that bellyaching about it is pointless other than it somehow relieves stress.